It was my second invitation to Mexico by the famed Baja tours star Bill Esparza, a.k.a. Street Gourmet LA, and not one to be taken lightly. This particular mission: The 10th anniversary celebration of La Querencia, Chef Miguel Angel Guerrero YagÃ¼es’ famous spot in Tijuana. It was aptly named Festival of the Hunt,Â with game meat being the hallmark of 9+ courses in all. The chef, for whom it is no coincidence that he is also a diver, hunter, and fisherman since his diners see his catches on their platters at La Querencia, had just returned from an expedition in preparation for this event. And so we enjoyed duck, goose, deer, pheasant, quail andÂ rabbit all for the purposes of this 12-hour, round-tripÂ adventure in Mexico. That’s how I roll. The wine pairings were an unfortunate component of the dinner, and were actually disruptive to our enjoyment of these carefully crafted dishes by Chef YagÃ¼es. After awhile, my fellow diners Bill,Â Chuy (whoÂ was a wonderful translator)Â Tomo and I stopped sipping the wine so we could really taste what we were eating. 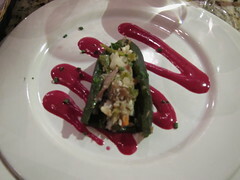 I loved this fiery-turned-sweet jalapeno, which encased rabbit escabeche. The pickled mixture inside the brown sugared jalapeno lay upon zags of a bright, delicious beet vinaigrette. It was definitely a dish for the senses; I licked thisÂ plate. 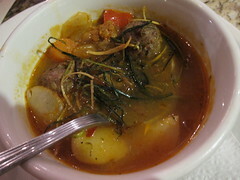 Another favorite of mine was a very unordinary meatball soup. In fact, it was an etouffe of pheasant breast meatballs and white fava beans. I don’t remember the last time I had pheasant, but the taste of these particular meatballs really shone against the mild-yet-still-flavorful tomato based soup and substantiveÂ fava beans. It’s probably the most flavorful breast meat I’ve had – very rich, tender and not gamey as an unexperienced palate like mine might expect (and yes, despite the theme of the night and cuisine of the restaurant). The texture of the soup was really played up with thanks to the addition of crispy onions. So delicious! 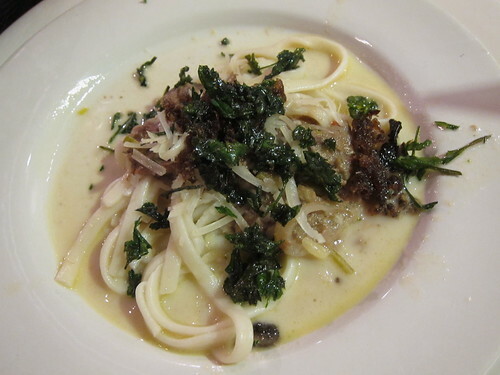 Last, but not least, was the linguine dish topped with Blacktail deer – probably the heaviest tasting meat of the night. The sparkling wine reduction and linguine were a great way to complement the shreddedÂ Blacktail, with the subtle,Â smokey charcoal notes bringing everything together. The portioning of this was perfect, with the 9+ course dinnerÂ culminating with this. This entry was posted in Food, Mexico and tagged 10 de Febrero, 10th Anniversary, chef, Dinner, Festival of the Hunt, Food, game, La Querencia, Mexico, Miguel Angel Guerrero YagÃ¼es, Tijuana, TJ. Bookmark the permalink.